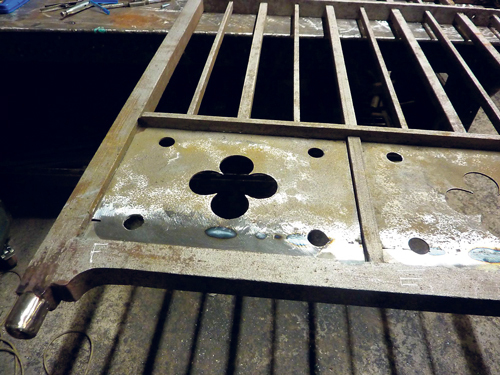 THE restoration programme which will eventually see railings installed around Page Park has seen three sets of gates removed and delivered to Bath-based Iron Art, were they have been stripped ready to repair. Once mended, the gates will be coated in zinc and painted black, a new gate will be made for the entrance on Park Road leading to the pavilion and all remaining gates will removed and renovated. Steph said: "Now the paint has been removed we were able to see what remarkable condition they are in considering their age. They look absolutely beautiful." New thresholds have been put in place at several of the gates as part of work to renovate the park's walls, and plans are afoot for the council's highways department to carry out work to the pavements surrounding the outside of the park. The remaining paths in the park will be resurfaced, including those around the pavilion. Work to put railings up around the whole park is expected to start before the end of the year.